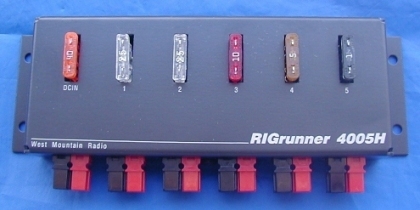 On this model, the connectors are mounted on the side so as to favor a Horizontal mounting position. Look at all the RIGrunner Accessories for a Crimping Tool, Powerpole® Connectors, Power Supply Cables, Extension Cables, Fuses and Black/Red Zip Cord. This model also includes 2 USB sockets for charging all your portable devices that need a USB socket for charging, 5VDC @ 1A. 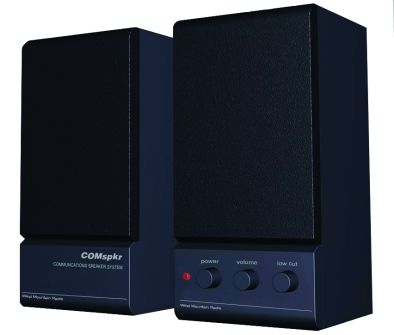 An amplified speaker system optimized for operation in close range of any radio transmitter. Exceptionally high rejection of radio frequency interference from 1 to 1000 MHz. Stereo High Fidelity response for use with voice or music. High acoustic power output that can be heard clearly in a noisy environment. Built in amplifier assures compatibility with most computers and/or two way radios. Comes complete with audio cables and UL approved wall power supply. Solid, resonance free, wooden cabinet. INPUT: Stereo line level 1/8" mini jack. 2007 & 2008 have once again proved the importance of Amateur Radio emergency preparedness. West Mountain Radio has products that can help prepare your ham station for 2008/2009 and any emergencies that may happen. A PG40S will, without interruption, safely power your station from either a Power Supply or a Battery and it also has a built in state-of-the-art multi stage charging circuit that will intelligently charge and maintain a battery. 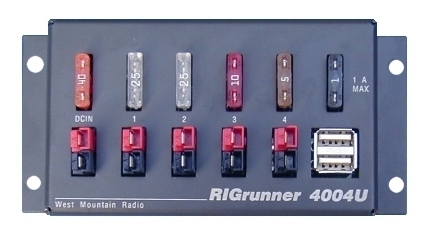 The Super PWRgate PG40S Backup Power Systems, when used in conjunction with a RIGrunner, will provide uninterrupted power to all your 12VDC Ham Station Equipment. We also carry quality sealed AGM and Gelled Batteries suitable for indoor use. Both are Group 24 size and are rated at about 75 AHr which will provide many hours of emergency operation. So that you will know the status of your batteries at all times, we have the WhattMeter which will simultaneously read out Volts, Amps, AmpHours, Watts and WhattHours. All of these products have Anderson Powerpole® connecters, especially convenient for all your 12VDC equipment. For installing Powerpole® connectors, we recommend our PWRcrimp Crimp Tool, a quality crimping tool designed specially for 15, 30 and 45A Powerpole® connectors. We also carry pre-packaged Powerpole® Connectors in 15, 30 and 45A sizes. change the Subject line to ADD ME TO THE RC HOBBY EMAIL LIST or REMOVE ME FROM ALL EMAIL LISTS. West Mountain Radio is 100% behind the CAN-SPAM Act which is an opt-out law. - our recipient EMail addresses have not been harvested from web sites.